In 1577, with Queen Elizabeth I as his sponsor, Sir Francis Drake set sail aboard his flagship, Pelican, on his expedition to circumnavigate the world. 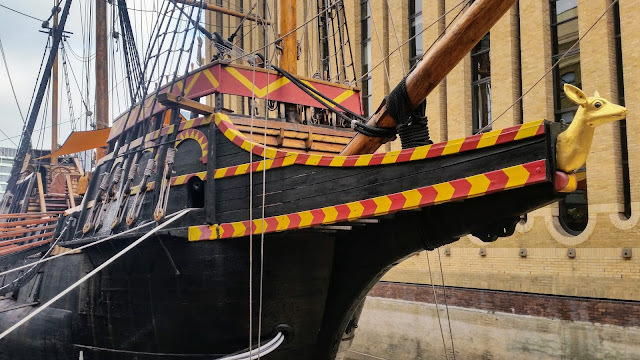 In August of 1578, he renamed her Golden Hind, to honour his friend Sir Christopher Hatton. Sir Francis Drake completed his voyage, in 1580, when he sailed the Golden Hind into Plymouth Harbour. His ship was then moored in Deptford Dockyard, as the first world's first museum ship. She would remain there until 1650, when she finally rotted away. Following three years of research and construction, using the same traditional handicrafts as the original, this replica was launched in 1973. She set sail, on her maiden voyage, in 1974, and arrived in San Francisco nearly seven months later. From there she sailed to Japan, where she appeared in the film Shogun, before she returned to England. She has sailed around the British Isles, travelled to the Caribbean, passed through the Panama Canal (twice), visited Vancouver, toured the coastal cities of the United States and, between 1992 and 1996, she toured the ports of Europe. In 1996 she was moored at Bankside, where she still resides to this day, allowing families to explore her decks, while learning about life aboard ship in Elizabethan times.